I took delivery of my model 3 within the first batch in Canada. I was actually a part of the opening day mass delivery day (200 cars). As it was the first day, the whole process of receiving the car took longer then it probably should have. However today's topic of discussion is public interest, not the crazy delivery day. I never considered buying a brand new car as it's a depreciating asset. However the technology driven model 3 really sparked my interest. But it is the environmental aspects that is most intriguing. An electric vehicle can drive 500km on a single charge. That is very impressive. 1) Due to the lack of texting available (which is amazing considering how technology driven this car is... it doesn't even have voice text! I will share a list of want lists sooner or later) I pulled over in a parking spot to check my phone messages. A man came up to the car, walked all the way around all while being maybe a foot away. His friends were standing farther back laughing. He was in awe just looking at it. I did end up talking to him as he asked a ton of questions. 3) I knew there was a Tesla branded charging station (as well as other EV chargers) near me at my local shopping mall. I went to go check it out. I figure it would be a bonus as I shop. As soon as i parked, other EV owners crowded around to see this new car. They were actually very helpful. They listed all the possible charging areas around me. There are actually quite a few, despite the closest super charger being 30 minutes away. 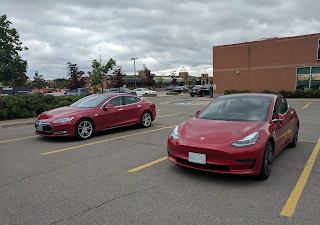 With just under a full week of ownership, regardless where I park the Model 3, there always seems to be swarms of people around it, asking questions. Or at the very least, pointing towards the car. It makes me slightly paranoid that something will happen to the car. I've read too many stories about keyed or broken Tesla's. However when considering that an electric vehicle is gathering this kind of attention, it shows that the general public is at least interested in an EV and want to know more. In the long term, as more people are able to afford an EV and make the switch, the environmental benefits will be great! *Bonus: I was putting groceries in the frunk. Someone walking by first thought that someone stole my engine. They were very concerned and serious.